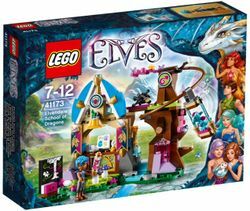 41173 Elvendale School of Dragons is an Elves set released in 2016. Ring the bell, it’s time for Dragon School! Work with Tidus Stormsurfer the Dragon Trainer to train Miku the baby dragon, to improve her flying! Ring the bell and start school with some flying lessons at the blackboard. Help Miku climb the tree during the break, and then time her with the hourglass as she flies down the zip line. Use the cookie shooter to encourage her to fly further. After practice, it’s time to take a well-deserved nap! Facts about "41173 Elvendale School of Dragons"
This page was last edited on 21 January 2018, at 19:27.